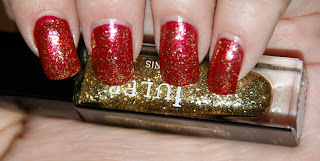 Princess Polish: First Julep Maven Box! This is my VERY first post as a Julep Maven and I'm rather excited about it! As you may recall, I signed up last month to become a Maven for a penny. Since then, I have received my first box in the mail. It included two nail polishes and cuticle oil in roll-on form, which was perfect since I have begun to make a concerted effort to improve my care of them. Hopefully, you have noticed in my pictures! This was the February American Beauty Box, which featured Glenn (named for 2012 Best Actress nominee, Glenn Close) and Oscar, who needs no introduction. First up is Glenn, a GORGEOUS rich, metallic berry shade. Though it is not remotely reminiscent of the movie Ms. Close was nominated for, Albert Nobbs, it does remind me of her turn as Cruella de Vil in the 1996 live action version of 101 Dalmatians. I had nightmares from that for weeks as a terrified six-year-old. But this shade was a total dream. The application was smooth and opaque in two coats, as you can see above. Now Oscar is definitely up my alley, rather than Mom and Nana, but that's because I'm all for the glitz and glam of glitter! In fact, before I decided on "Eat your heart out, Kate... you too, Pippa" as the tagline for Princess Polish, I was toying around with the phrase "So glamorous, she cries glitter." While I'm sure I could get Oscar to fully cover my nails with enough coats, I wanted to use the pair in my box as a duo. So I threw on a coat of Oscar and had a glammed up look. I could totally see myself rocking this for a party! So that is the February Maven box... and I can't wait for the March box from Maven. Though, I might have to switch to the It Girl box. A holo top coat is SO hard to resist! Thankyou for the Julep Maven Coupon code.. I can't wait to use it! Oh and, nice cuticles! Thanks, Amanda! It was so nice of you to use my link! And I'm glad my cuticles are noticeably better. Still trying to moisturize often... not always remembering.